The core of the radiator is composed of tubes and fins. At each end of the core are the headers which include an inlet/outlet for engine coolant, and sometimes include a transmission oil coolers and/or an engine oil cooler which is inserted inside one of the headers. To cool down the engine, hot coolant flows from the engine into header via the inlet and then cools down as it circulates through the tubes to the opposite header and cold coolant exits back into the engine via the outlet and the cycle is repeated. As it circulates through the tubes, the coolant transfers its heat to the tubes which, in turn, transfer the heat to the fins that are lodged between each row of tubes in a zig zag pattern. The fins then radiate the heat transferred by the tubes to the surrounding air, hence the term radiator. Q. Is there anything we can do about the flakey or rust problem on my diesel fuel tank? A. We have solutions gas tank relining. We also have high quality plastic tank replacements. Q. Can you clean the oil from my charged air cooler? A. Yes, we have a flush machine to achieve the cleaning. Q. Is the work done on the premise. A. Yes, all the work is done at our location. Q. 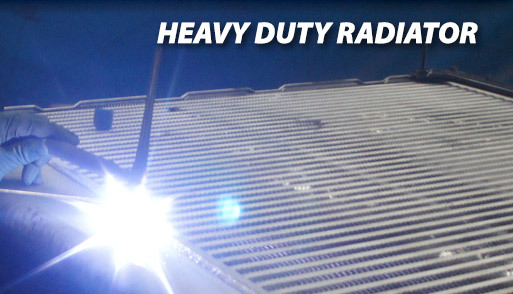 Do you repair or weld aluminum? A. 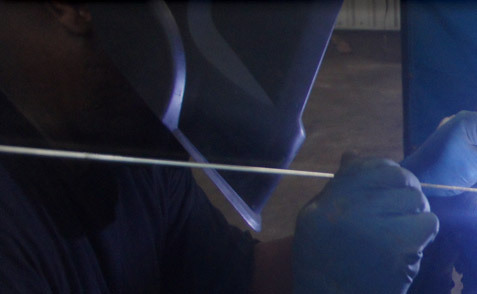 Yes, we aluminum weld and also have a low temperature rod process. Q. Can you increase the cooling capacity in my radiator? A. Quite often we can increase the tube and fin count on a new core. Q. Do you use any parts Made in the USA? A. Unfortunately, less and less parts are Made in the USA, but when they are, we support them. Q. Do you re-core old heaters? A. Yes, cores are available and we do them all the time. Q. Do you stock truck radiators? A. We have a large inventory and are direct with some of the largest manufacturers. Q. Do you have a sales representative that can stop by my shop? A. Yes we do. They will be more than happy to tell you about our services. Do a preventative cooling system maintenance check at least once every two years. #1 A radiator pressure cap test to check for the recommended system pressure level . #2 A thermostat check for proper opening and closing. #3 A pressure test to identify any external leaks to the cooling system parts; including the radiator, water pump, engine coolant passages, radiator and heater hoses and heater core. #4 A visual inspection of all cooling system components, including belts and hoses a system power flush and refill with car manufacturer's recommended concentration of coolant. #5 An engine fan test for proper operation. By performing regular checks, You can prevent problems, emergency repairs and/or replacements, effectively saving you time, trouble and money. Flush and repair: We remove the radiator from the vehicle, Then it is cleaned externally using a powerful spray gun and flushed internally. Then we pressure test, inspect and repair as needed. Clean and repair: We removed the radiator from the vehicle, Then we clean it and flush it internally by cleaning it in a specially formulated cleaner. It is then flushed, pressure tested, inspected and repaired as needed. Rod-out and repair: We remove the radiator clean it externally and flush it internally by immersion. It is then pressure tested, inspected and repaired as needed. One or both tank (tanks) is removed and a rod is inserted into each tube to remove debris. Once complete, the radiator is reassembled and tested. Recore: When a radiator core is to weak to hold up under normal operating conditions or it has been damaged beyond repair a new core must be installed. Plastic radiator tanks and gasket replacement: We removed the radiator from the vehicle and detach the damaged tank and gasket. The tank and gasket is replaced with new parts and the radiator is tested. Rebuilt radiator: We remove the radiator from the vehicle, We then remove both tanks from the core. we inspect the flow of the core and if needed we rod-out the core. We then place the radiator into a ultrasonic cleaner to clean the tube to header joints. It is then flushed and all the tubes are soldered at the header joints. The tanks are install and it is pressure tested.